My boyfriend’s favorite cuisine is Japanese while I, on the other hand, have never been a fan of Japanese food until Yabu. I used to think that Japanese cuisine only consists of raw meat/fish in a roll with rice and a slice of mango. I am not into anything raw and I like my food always served hot that it fogs my glasses. As of the moment, Yabu is my favorite restaurant because it changed my mind about Japanese food. We tried the rosu and hire sets with my boyfriend having the rosu and I, the hire set. 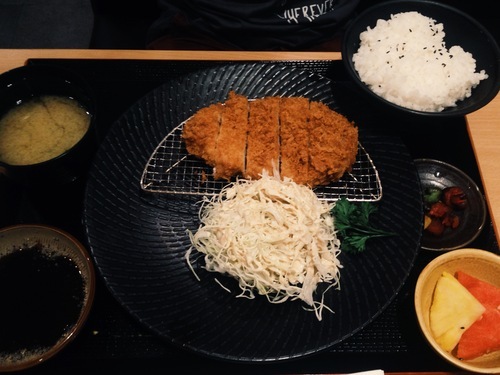 You might be wondering what is the difference between these two types of tonkatsu. Yabu differentiated the two with Rosu or porkloin as that served with a sliver of glistening fat trimming its edges, and Hire or tenderloin as sliced without the fat. Our sets arrived not long after we made our orders. My boyfriend got his Rosu (90g) set which consists of the rosu, a bowl of Japanese rice, a bowl of miso soup, fruits (a slice of watermelon and a slice of pineapple), Japanese pickles and shredded cabbage. I got my Hire (100g) set, which was very similar to that of my boyfriend’s set with the hire instead of rosu being the difference. We started to eat through our set with the miso soup. It was served really hot and tasty, unlike other restaurants’. The shredded cabbage would go well with the three different dressings that were available. We used the goma dressing or also known as the sesame dressing. The cabbage was shredded well, which made it very easy to eat. The sesame dressing went really well with the cabbage. The serving was generous, though the set offers an unlimited serving of it. The meat (rosu and hire) in our sets was also served in generous amounts. It was soft and thick and not very oily. The breadcrumbs or panko that covered the meat was golden and crunchy. 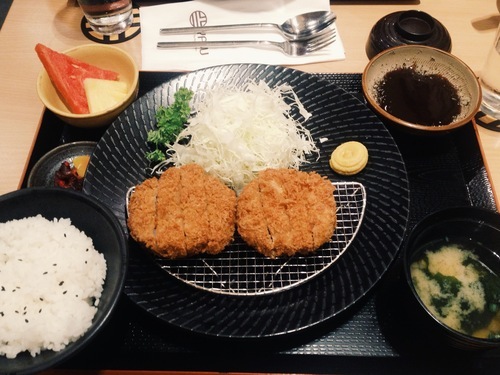 Yabu’s tonkatsu sauce was thick and sweet and perfectly matched the pork cutlets. We enjoyed our meal because the place was clean and there were only a few people for it was still early. Their branch in Robinsons Magnolia is not very spacious but there is enough space for each individual to not feel as if another person is about to pop their bubble.